Prayer is the way we get the following (not just the feeling!) inside us. 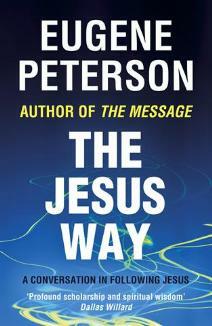 The heart of this book is a simple argument: the way we follow Jesus is vitally important. Peterson is concerned that too often churches and Christians claim to follow while at the same time using methods and adopting attitudes which are drawn from their own culture rather than from the biblical witness to Jesus. We can’t gather a God-fearing, God-worshiping congregation by cultivating a consumer-pleasing, commodity-orientated congregation. When we do, the wheels start falling off the wagon. And they are falling off the wagon. We can’t suppress the Jesus way in order to sell the Jesus truth. The Jesus way and the Jesus truth must be congruent. Only when the Jesus way is organically joined with the Jesus truth do we get the Jesus life. This third book in Peterson’s Spiritual Theology series again demonstrates his method of exploration through conversation. The book is systematic in the terrain it covers rather than in the arguments it pursues. Tangent and digression are as important as thesis and application. The book is structured around a series of biblical case studies, characters whose stories and testimonies enrich our understanding of what it means to follow Jesus faithfully. Abraham shows us aspects of faith, David demonstrates God’s dealing with imperfect people and Isaiah points us to the holiness of God which resists our attempts at magical manipulation and requires that we deal with God on God’ terms rather than our own. As well as these positive Old Testament stories, there are cautionary studies from the New Testament. The power play of Herod and the manipulation of the Pharisees, for example, are contrasted with the simple faith of Mary which makes the incarnation possible. A review of Caiaphas leads to a reflection on the necessary relationship between religious institutions and a living spirituality. prayer both internalizes and embodies Jesus; there is no other way into the Way… Prayer is the way we get the following (not just the feeling!) inside us.